Launching today, EmailVerifier.com is a next generation A.I. powered email verification and list hygiene platform, created to enhance the efficacy and value of corporate subscriber databases. Email marketing is one of the most valuable forms of customer contact available to businesses. However, its value can be significantly undermined by poorly maintained subscriber lists. If emails aren’t being opened, or are unable to be delivered, they are not only worthless, but actively damaging to a company’s online email sending reputation, increasing the risk of ISP blacklisting. EmailVerifier.com has been designed to ensure that all subscriber addresses on a business email list are healthy, active and genuine, making sure that every marketing campaign hits its target. Through the use of a unique, proprietary and sophisticated algorithm, EmailVerifier enables companies to confirm if an email address exists and is able to receive communication. It will remove addresses that present a high risk of bouncing – including fake, mistyped, disposable, spam signups and addresses that are no longer active – and thus harming email sending reputation. EmailVerifier doesn’t, however, just work as a housekeeping exercise, performing scheduled subscriber list clean ups. Once activated, the real time API can be used as an additional validation step on lead generation forms and signup pages, preventing all ‘bad’ addresses from being added to an active database. What can EmailVerifier.com achieve for a business? 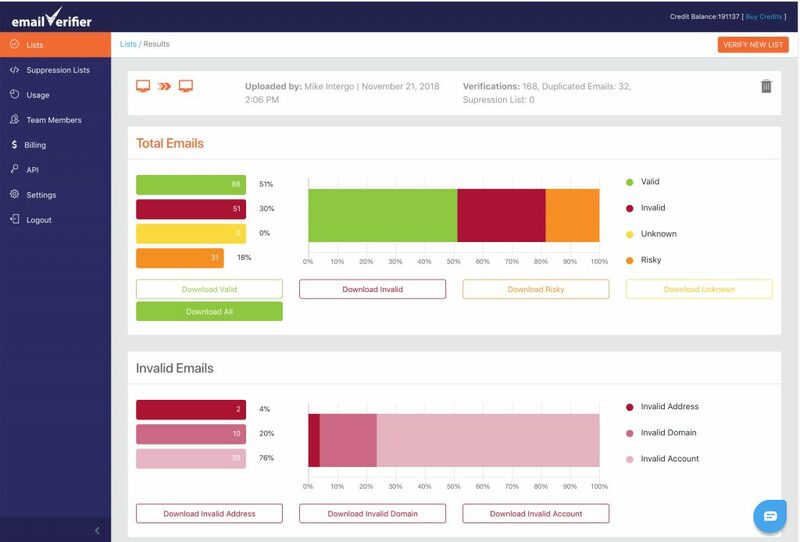 First and foremost, by ensuring that a company’s email sending reputation remains at its highest level, EmailVerifier helps to reduce the risk of your business’ IP address and domain being blacklisted by ISPs. But, there’s much more to it than that. If a subscriber list is healthy, email inbox rates will increase, which in turn will lead to higher engagement and thus higher ROI in email marketing and CRM activities. EmailVerifer system implementation can be a helping tool towards GDPR compliance. Marios Italos, Director of EmailVerifier.com, comments: ‘Not so long ago, email marketing fell out of favour, being considered too risky and tricky to manage, especially by smaller companies. It was too easy to not stay up to date with your email marketing, get a high bounce rate and see all your hard work wasted. ‘The thing is, it can be enormously valuable for a company – generating up to 58% of all revenue for a business, according to the Direct Marketing Association – so rather than avoiding email marketing, it’s better to take steps to get it right. A healthy, well-maintained subscriber list a really important place to start. Interestingly, GDPR has shown us that a huge number of businesses have not been in that position, allowing their lists to idle. And that’s probably because maintenance is a difficult thing to manage. The idea behind EmailVerifer was to simplify that process through the use of A.I.